Installation Instructions for APPX Release 5.1 and higher are found here. Be sure that you are logged in as root user before beginning the installation. To simplify the process, start by copying the APPX License Key (the entire e-mail is fine) into your /tmp directory, under the name 'appx-registration.txt'. Create an OS UserID "appx". This UserID will own all files in the APPX directory. Run the APPX installation script, 'install.sh'. When it is complete, starting APPX should automatically locate and install the License Key, and the installation is complete. Be sure that you are logged in as root user before beginning the installation. To simplify the process, start by copying the APPX License Key (the entire e-mail is fine) into your /tmp directory, under the name 'appx-registration.txt'. Create an OS UserID "appx". This UserID will own all files in the APPX directory. Run the APPX installation script, either the RPM file or the 'appxsetup.sh' script, depending on whether your Linux distribution supports RPM. When it is complete, starting APPX should automatically locate and install the License Key, and the installation is complete. Be sure that you are logged in as administrator (in multi-user systems) before beginning the installation. Run the APPX installation program, setup.exe. When it is completed, running APPX will prompt you for a registration (License Key). Copy the License Key file into a folder of your choosing (C:\appx, for example), and you can then import the registration from that location. Once the registration is installed, exit APPX, then re-enter and the installation should be complete. 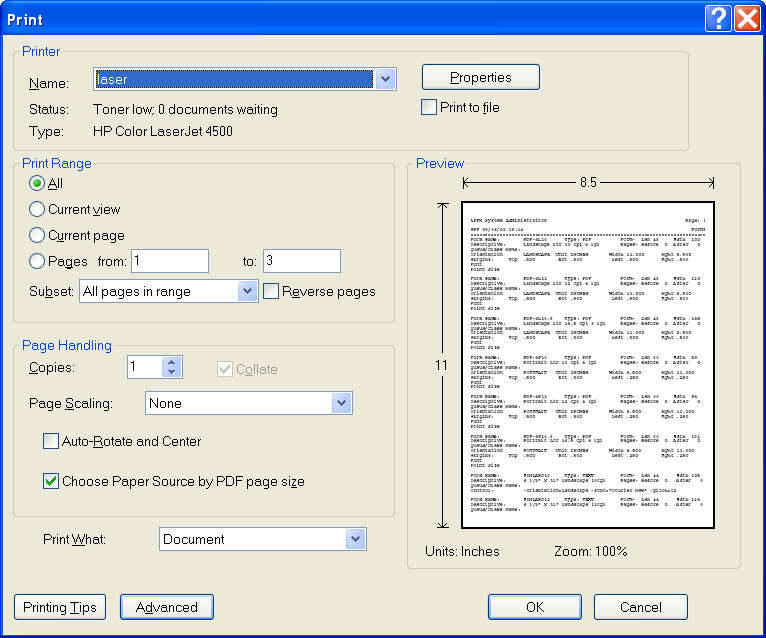 As you know, this release of APPX includes the ability to create print files as pdf documents. To view or print pdf documents, you will need to download and install Adobe Acrobat Reader for both your server and your desktops. Please download and install Adobe Acrobat Reader 6 on your desktop systems. Acrobat Reader will be needed for viewing pdf reports on screen, client side (local) printing of pdf reports, and for viewing pdf output for APPX Inquiry processes. To print pdf documents that are queued to your APPX server, you will need to download and install Adobe Acrobat Reader on your server. There is a version of Acrobat Reader for each platform supported by APPX. The first time you view a document with Acrobat Reader, you will need to set a couple of the print options. Otherwise, APPX reports that you print with Acrobat Reader may be scaled to a different size than you expect. This screen shot shows the necessary settings. The important ones are in the section titled: Page Handling. Acrobat Reader will "remember" these setting once you set them. You will need to define one, or more pdf FORM definitions in APPX System Administration. This document shows the forms that we have been using when printing pdf documents. You will need to define these or similar forms in order to print to a pdf document. APPX 4.1.a data files and design files are compatible with 4.2.0 but you will need to create new structure files for each of your existing applications that you upgrade to the APPX 4.2 environment. Simply remove the Struct directory for each application and then run Create Files within Design File Management for each application. Within Application Design, there is a utility that you will need to run for each application. Enter Application Design, select the Utilities tab, run Sync Widget Elements. This utility only needs to be run once for each application but it won't hurt if you should run it twice. This utility can also be found on the Design File Management menu within APPX System Administration. (Be sure to note the different paths to the files!) The installer should then run APPX and go to System Admin File Management and run create files to create a new key file for the PRINTER file. A new complete installation of APPX 4.2.8 or newer will not require these steps. If you have any trouble installing APPX, please e-mail us at techsupp@appx.com. If you are installing a Linux promotional license, please use linuxsupport@appx.com instead. Microsoft, Windows, Windows Server, Windows Server 2000, Windows Server 2003, Windows Vista, Windows XP, Windows 7, Microsoft SQL Server, Microsoft Access and Microsoft Excel are registered trademarks of Microsoft Corporation. All other products may be trademarks or registered trademarks of their respective companies.